Sometimes when I am scrolling through Instagram, I am mesmerized by images of tiny and intricate amigurumi, stunning new stitch patterns, or breath-taking yarn. When I first discovered the gorgeous yarns by Knit Collage, I could not stop staring at all their incredibly unique and whimsical fibers. Never before had I seen natural fibers spun with bits of ribbons, sequins, or flower appliques! Amy Small is the brilliant mastermind behind Knit Collage, which she started in 2010 as she fell in love with hand spinning long ago. 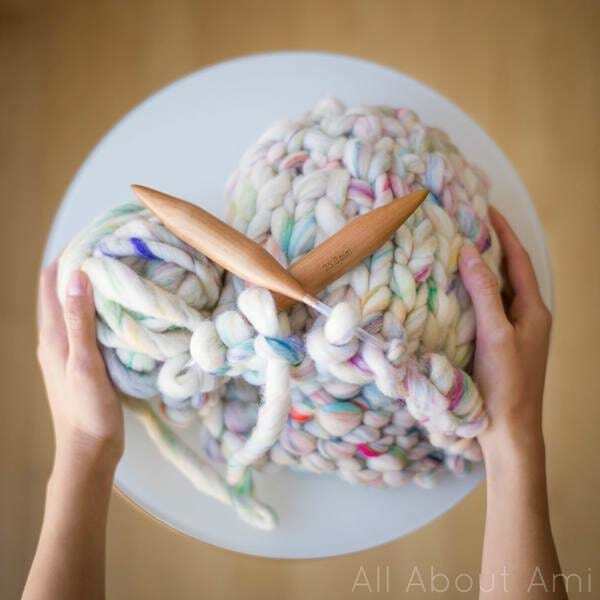 Amy is constantly inspired by the places she travels such as India and Hong Kong, and is continually challenging herself to come up with new colors and spinning techniques. Her creativity and passion for fibers is evident in all her work and it is so easy to get lost on her website as you scroll through images upon images of amazing yarn. All the Knit Collage yarns are dyed, carded, and spun in Punjab, India by a team of 15 women who Amy taught. 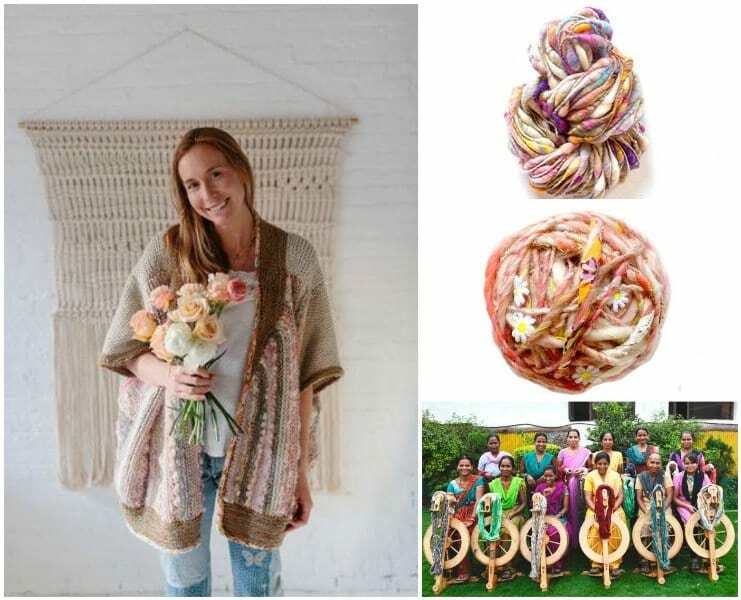 When you purchase yarns by Knit Collage, you are supporting the livelihood of the women who craft them in India as well as Amy’s US-based small business! As you can imagine, I was ecstatic when Amy reached out to me and asked if I wanted to try out one of her yarns! I had admired them for so long on-line and could not wait to feel and work with some in person! Amy sent me her incredible “Wanderlust” yarn in the colourway “Frolic“. 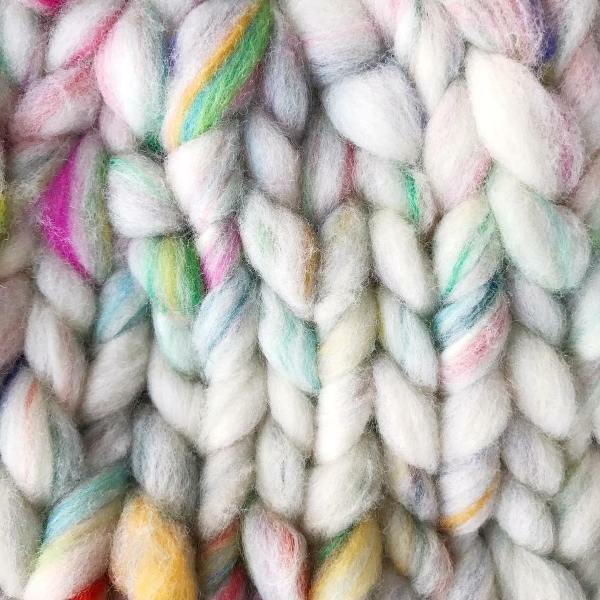 It is a super bulky 100% wool that has a rainbow of colours peeking through. Typically I tend to stick with neutrals, but every so often, I LOVE working with bright colours! 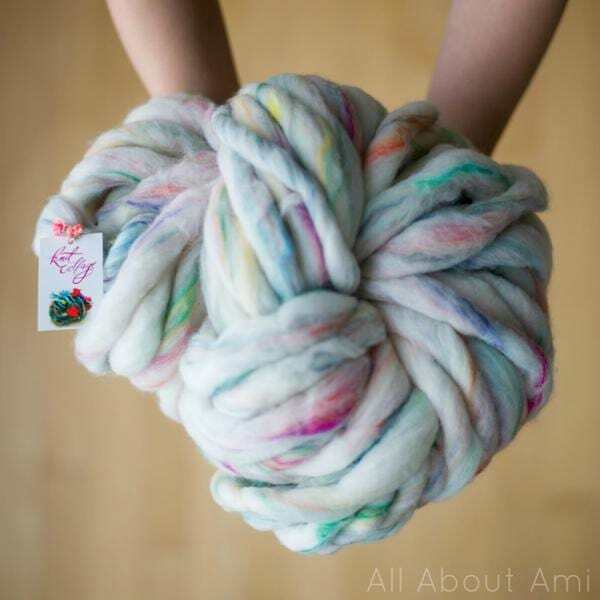 Amy loves natural fibers and most of Knit Collage’s yarns use wool or mohair. The wool fibers are sourced from Australia and the mohair comes from South Africa. Spinning one skein of their yarn takes around 2 or more hours and all the fibers are hand dyed and hand carded. Thus, no two skeins are ever alike because of the intense handmade process that goes into each and every skein! One skein of Wanderlust contains about 30 yards of wool (200 grams), and I heavily debated between knitting a cowl or a hat with my Wanderlust. I knew a cowl would be incredibly gorgeous with these vibrant colours, but I had also seen the stunning “Pom Bomb Hat” on the Knit Collage site HERE designed by Susan Sheby. After plenty of back and forth, I finally decided to make a statement hat! Once I started knitting with Wanderlust, I was amazed with the beautiful stitches that resulted as the colours that came forth were always a surprise! 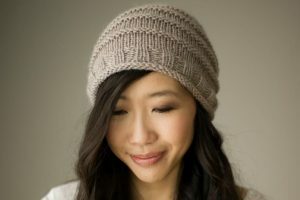 To knit my hat, I used my 25 mm circular knitting needles from Mama Knows Luxury. The pattern states that you need the entire skein to knit the hat, so I hoped that I would not run out of yarn and tried to knit a bit more tightly! I learned some new techniques while knitting this hat and had so much fun working through the pattern. As I was about to finish the second earflap, I started getting worried that I would run out of yarn! My mind raced as I thought about possible alternatives or how to modify the pattern if needed. Thankfully, I managed to finish the second earflap with *just* enough yarn left! I was jumping for joy when I finished my hat! Once again, I used my handy dandy Clover felting needle tool to felt the ends to the rest of the hat since Wanderlust is 100% wool. 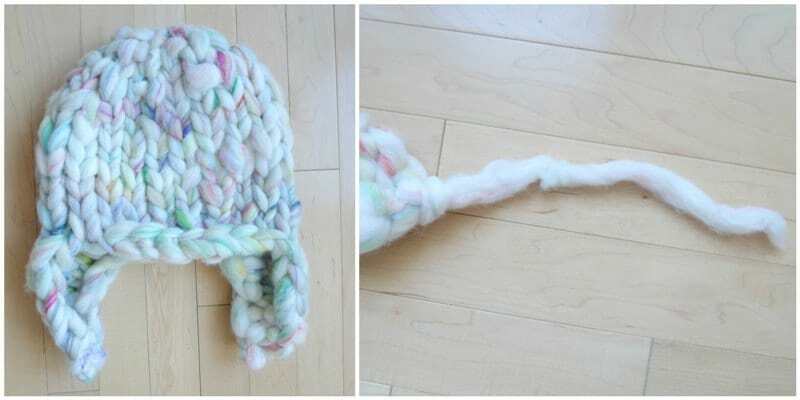 Be sure to check out my “How to Felt Yarn Ends Together” tutorial as it is VERY important when working with precious wool since you do not want to waste any by weaving in ends! 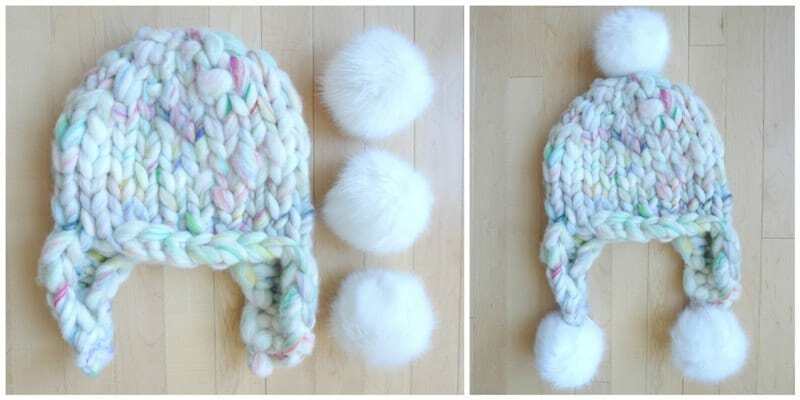 As an AMAZING finishing touch, the Pom Bomb Hat calls for 3 white Bernat faux fur pom poms to be added: one at the top and one at the bottom of each earflap! I’ve never added 3 pom poms to any hat before, and they really complete this bold hat! I finished the Pom Bomb Hat just in time for our visit to the Ice Castles! We were so excited to visit as we were unable to go last year when the Ice Castles first debuted in Edmonton. They were breath-taking, and we enjoyed the stunning backdrops, epic music playing, fireworks, fire twirlers, and slide (sadly the adult one was closed since the temperatures were warming up, but Myla enjoyed the child slide)! We dressed warmly as we knew it would feel colder within the Ice Castles since we would be surrounded by ice! They closed the afternoon hours so we could only go at 6 PM, just as the sun was setting! I am so in love with my statement Pom Bomb Hat with its brilliant colours and luscious pom poms! The girls had fun exploring the Ice Castles as well! They were able to take pictures with two snow princesses who resembled Queen Elsa & Princess Anna! They also wore their Fuzzy Crochet Bear Cowls that I made for them using alpaca yarn for Christmas! And in case anyone is curious, my snow boots are the Joan of Arctic Boots by Sorel, and my jacket is the Britannia Parka from Aritzia! I am so incredibly excited to tell you that Amy has generously offered to give away TWO skeins of Wanderlust yarn to two readers (1 skein to each person)! You will LOVE working with this incredible and luxurious yarn 100% wool! Wanderlust has been very popular, and Amy currently only has two colourways available: Magic Galaxy and Lullaby. (a) which Wanderlust colourway you would prefer: Magic Galaxy or Lullaby (see what these colourways look like HERE). (b) what you will make with your Wanderlust wool (e.g. hat, cowl, etc – see examples of patterns using Wanderlust yarn HERE). The winners can choose a pattern from the Knit Collage database! This giveaway is open WORLDWIDE and will close on Tuesday, March 14 at 8 PM MST. You can also enter through Facebook and Instagram to increases your chances! Follow Knit Collage on social media and see how you can take part in their exciting Knitalong coming soon! I can’t wait to rock my Pom Bomb Hat for many many years to come as I brave the cold Canadian winters! Note: Thank you to Amy of Knit Collage for providing me with the Wanderlust yarn to work with! All opinions and views expressed are 100% my own!